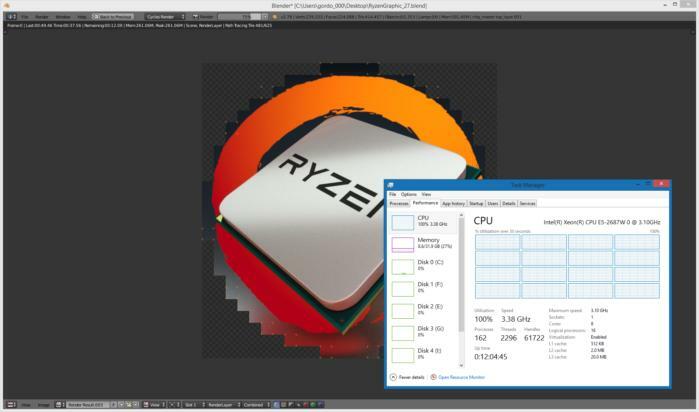 The test AMD used to show off Ryzen is open-source, so have at it. 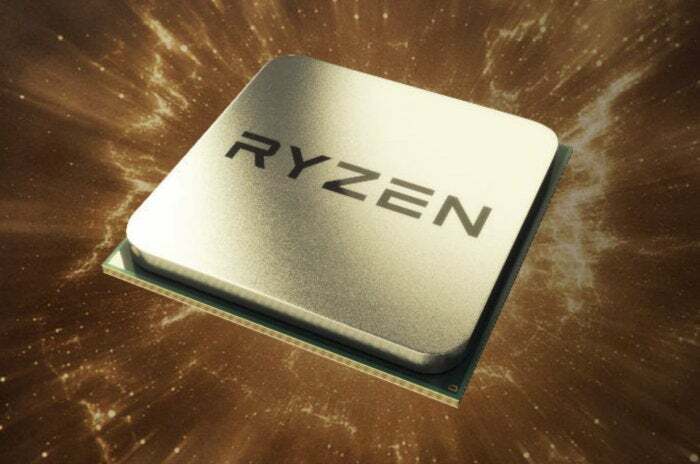 The Ryzen hype train has left the station, and to build up its speed, AMD has actually released the source file it used to demonstrate just how fast its upcoming eight-core Summit Ridge CPU is. 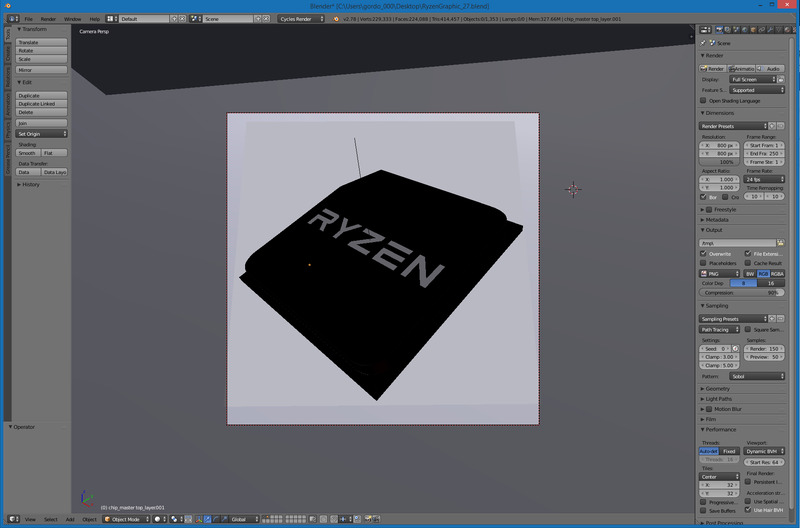 This doesn’t usually happen, but because Blender is open-source and free, we now have a way for both haters and fans to test their own PC against the first Ryzen-based chip. 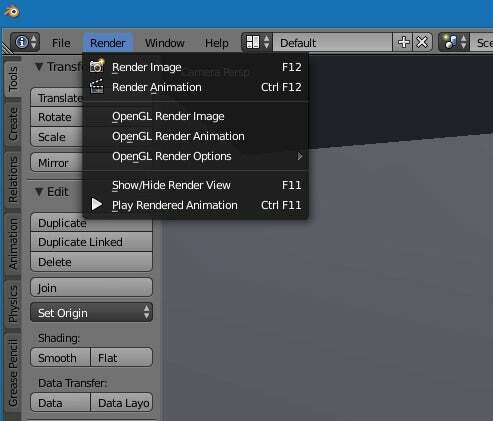 Blender is a popular and free renderer. 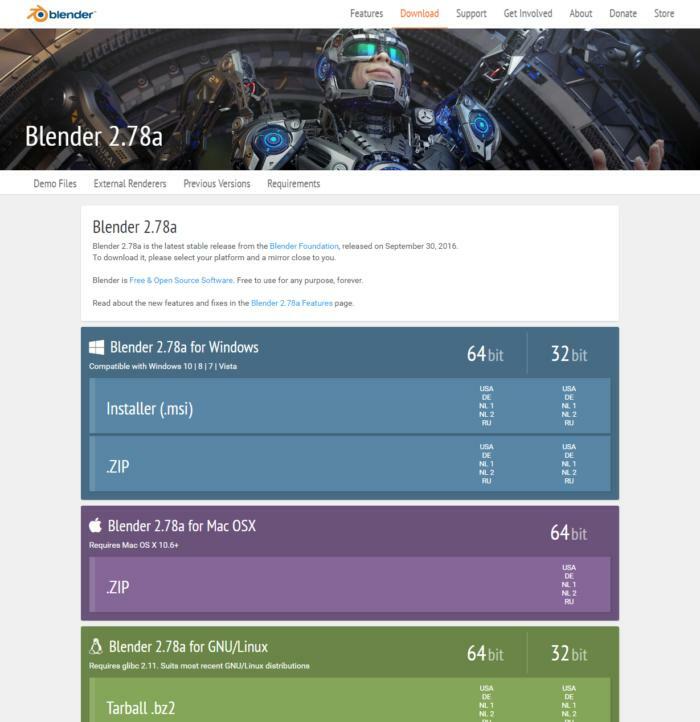 First, download the appropriate version of Blender for your operating system from www.blender.org/download. This is a popular and free render that can produce some spectacular results, such as the open-source Tears of Steel movie. The version AMD used is the current 64-bit version of 2.78a for Windows 10. Blender updates can cause performance creep, so you should only use the same version for your testing. A note for OS X and Linux fans: Blender has been and is OS-sensitive, which means it’s faster on some and slower on others. That’s fine though. If you to brag about how this OS is superior to that OS in a CPU render, you can do that. But if you want to try to replicate AMD’s test on your hardware, you need to run it on Windows 10. And yes, I mean Windows 10, because Blender results under Windows 8 and Windows 7 won't match up. Once you have Blender downloaded and installed, you’ll need AMD’s source file which is available from http://download.amd.com/demo/RyzenGraphic_27.blend. If you are really serious, you can run processidletasks, but most people don’t need to. If you just want a casual result you can skip the formal preparation of your PC. If you want a result that is possibly more repeatable, you should disconnect your machine from the network and reboot your machine. You'd typically wait a few minutes for it to “settle down.” You can even invoke the “process idle tasks” command and then wait 15 or 20 minutes. 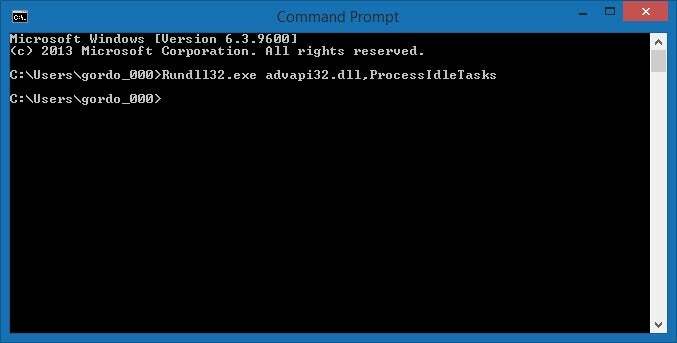 ProcessIdleTasks basically tells Windows to perform its housecleaning tasks immediately, so they're less likely to happen during testing. If you're going to be a stickler, you can also temporarily pause any anti-virus programs while running this program. The vast majority of people reading this can just skip this step, but obviously don’t play a game or browse the Internet while the test is running. You should be ready to run the test AMD has run if your screen looks like this. To begin the test, double-click the RyzenGraphic_27.blend file that you downloaded. Assuming the OS associated the .Blend project with Blender, this should launch Blender and open the file. If it didn’t, just start up Blender and select File > Open and point it to the RyzenGraphic_27.Blend file. The latest file should have a default sample size of 150 but you should check this setting to be sure. You're almost ready to hit the launch button, but the last thing you should check before you proceed is the render sample size. If you downloaded the file within the last day, it should default to a sample size of 150. There’s been a lot of confusion over the sample size, because AMD has performed the demo at 3.4GHz twice with two different settings. 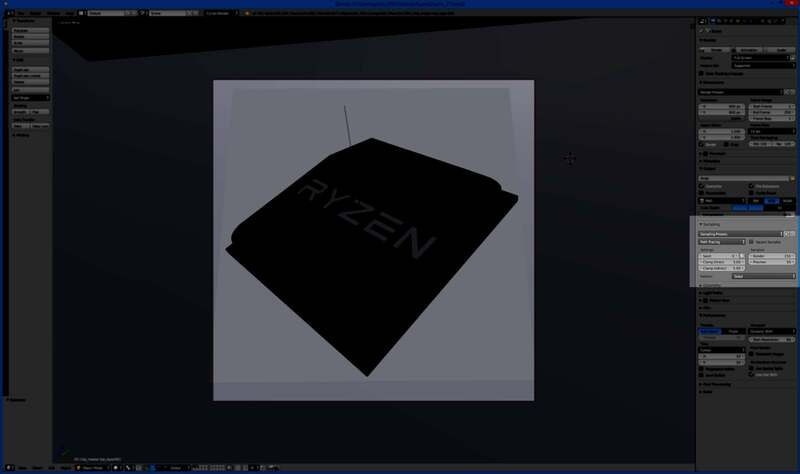 The public demo AMD did at its unveiling of the Ryzen used a sample size of 150 and took 36 seconds. I verified the results and the sample size with AMD as of Friday morning. AMD also initially released the test file with a 100 sample size but has since updated it to 150. So yeah, there’s a lot of confusion. Just make sure you set yours to 150. You can click Render or hit the F12 button. You’re now ready to go. You can pull down the menu and click Render or simply press F12. (Sorry, we can’t help MacBook Pro Touch Bar users find that button.) Blender is heavily multi-threaded, and the completion time will vary based on the clock speed, microarchitecture and core count of your PC. The Blender demo AMD is using for its test loves CPU cores. How does your machine compare? We know the eight-core Ryzen takes 36 seconds for a 150 sample size on Windows 10. That tracks with an Intel eight-core Core i7-6900K CPU on the same test settings. The eight-core Xeon E5-2687W machine running Windows 8.1 that I used to take these screen caps coughed up several 49-seconds runs. Don’t take this as the final word on Ryzen performance. That won’t happen until the chip is the hands of reviewers, and more controlled and comprehensive tests can be run. Still, that won’t stop you from running the test on your machine so you can brag about it on your favorite forum of choice.